The geeks have actually inherited the earth, everybody else just hasn’t figured it out. I work for an extremely large technology company and am on the way back from our annual user conference which was attended by about 60,000 people. This gave me great perspective on some trends which have accelerated and are changing everything you know. This week was the first time I can remember when it hit me that science fiction is becoming reality. Of the many charts and graphs I’ve seen, one which has generally seemed valid is Gartner’s Hype Cycle. This is how it goes. There’s a technology trigger which is very early and unique. 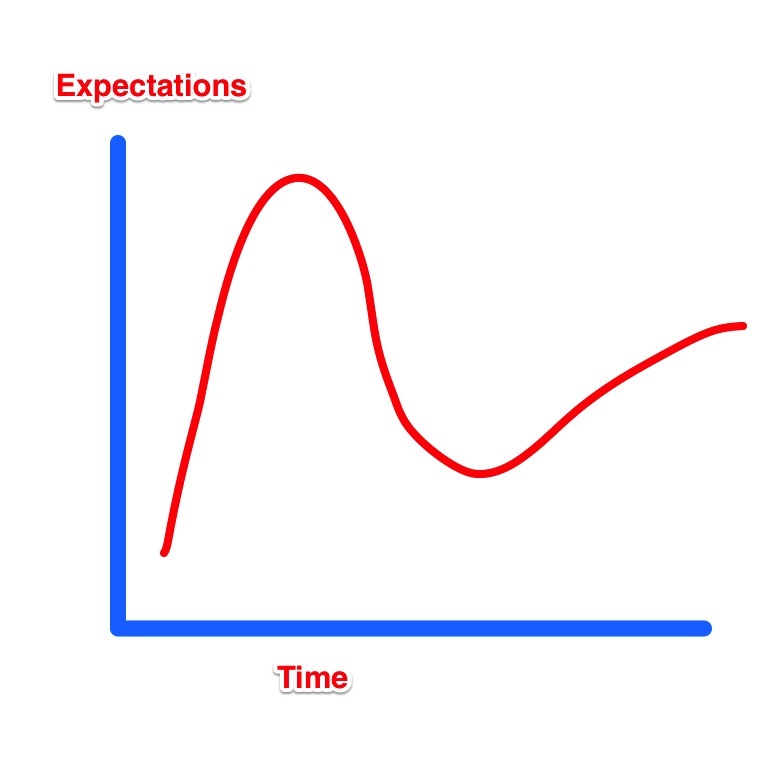 Often, it gets overblown and there’s a peak of expectations. This is followed by a trough of disillusionment where people realize that while the new technology is the greatest thing since sliced bread, that bread isn’t going to solve world hunger. Finally, there’s a growing trend of adoption and then general acceptance. The trough of disillusionment is vanishing because rapid innovation is blowing it away entirely. Sure there’s going to be failures but that’s actually viewed as a good thing these days. Believe it or not, there’s an emphasis on failure in smart businesses today. Nobody wants the trough and the risk of not making the upslope. They want to completely reshape this curve through fast early learning. That means that the peak of inflated expectations won’t be inflated at all. It will be the peak of adoption with general acceptance. Enabling cloud platforms and ready access to analytic tools make failure cycles faster and more likely to be successful. Here’s how I think it will look. No. How it looks when it’s done right and the market shifts. Tomorrow’s Cycle: Iterative rapid failures with rising adoption of maturing product. The curve is being influenced by the digital divide and the geeks are reshaping the earth. 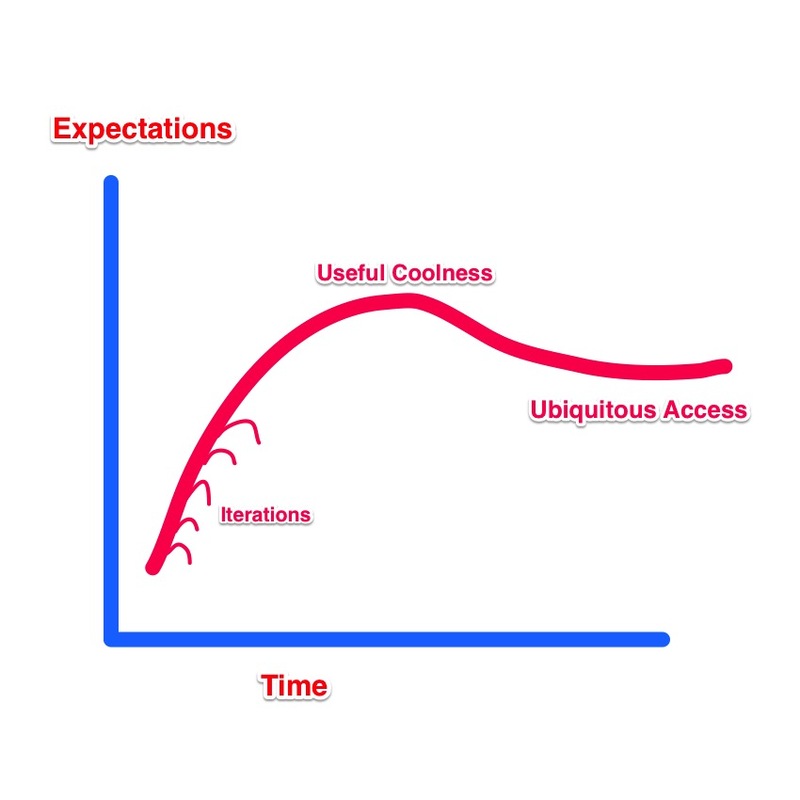 One concept I crystalized from the conference this week is how adopters will affect the curve. Everyone has seen the videos of babies with iPads then with magazines or books. It’s cute and enlightening. They’re digital natives. At the other end of the spectrum are digital immigrants (not my term, I heard it at a keynote talk by the CMO and CIO of Tesco). They’re either luddites or just not savvy enough to maximize what they have access to. They need to be designed for in the new world as much as the natives. You can see and feel this shift every day. I remember a time back in 2007 when I was sitting in O’Hare airport using a laptop to access a server while I was tethered to my cell phone via Bluetooth and on AT&T’s network. I got a phone call which I answered on my Bluetooth headset. The whole thing worked even six years ago and now it’s finally gaining general acceptance. But it took time. Smartphones have accelerated this process because computing power is becoming ubiquitous and, more importantly, accessible. I think of all the times I’ve had to take taxis on business trips. Yesterday’s model was carrying a wad of cash around. I could also strive to find a cab equipped with a credit card reader. 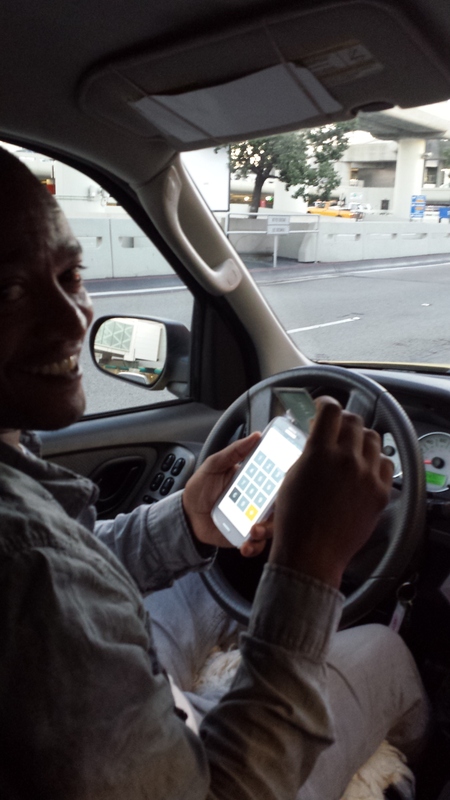 If I didn’t have cash, the cabbie was out of luck with my business or would have to take a rubbing of my card. I’m sure that led to lost or delayed money for them but maybe not enough to justify spending the money on expensive equipment if they were independent. Today’s model is below: Square. It’s why Amazon is giving free personalized live support on the new Fire HDX tablet. To make the device “disappear” into the experience. The next big things which are here involve people called “makers” with 3D printers and the Internet of Things (IoT). Makers can print their own replacement parts by downloading a virtual model somebody has posted online. They can build structures never before possible including new surgical implants. They can prototype their own creations and fail or succeed rapidly. People using the IoT can hack their house to play music when they turn on the lights or text them when the soil in the garden dries out and the tomatoes need watering. This printed hand is about 1/10th the cost of a low end prosthetic. Think this is cute or in a hype cycle destined for a trough? Think again. Ready made tools are becoming more and more accessible, economical, and friendly to use. Consider products like the Fitbit, Jawbone Up, Pebble smartwatch or Nest home thermostat. Daily objects are becoming connected at a rapid rate. Google Glass may seem nerdy but it proves that the digital world is overlaying the physical one in ways which people and businesses are rapidly learning to leverage. Even the digital immigrants are a part of it, they just don’t know it yet. The new model is much easier for everyone. Marketers learn to track “digital body language” which is why you see relevant ads as you browse the web. When you fill out a form online you get messages designed for you. Web sites are personalized to be relevant without you realizing it. Businesses analyze social media streams to track sentiment and promote products to the right buyers. What happens when you overlay this explicit digital body language with the big data collected by the IoT, credit card providers, retailers, mobile phone companies, and more? Is Minority Report science fiction? I think it is but the premise of reality is actually much much bigger. Advertising in Minority Report is obvious and in peoples’ faces – literally since it’s based on retinal scans. Our world will be more subtle. Experiences powered by big data will – and are – designed to be pervasive and transparent. Just ask Jeff Bezos. Digital immersion is here and those natives who live there will crush the hype cycle and rule the world while the others cling to old paradigms.